People with cystic fibrosis . What are the risk factors for type 1 diabetes?What are the symptoms of type 1 diabetes?How is type 1 diabetes diagnosed?What are the treatments for type 1 diabetes?Are there screening tests for type 1 diabetes?What are the complications of type 1 diabetes?How can I reduce my risk of type 1 diabetes?What questions should I ask my doctor?What is it like to live with type 1 diabetes?Where can I get more information about type 1 diabetes? Diabetes mellitus type 1. EBSCO DynaMed Plus website. Available at: http://www.dynamed.com/topics/dmp~AN~T116244/Diabetes-mellitus-type-1 . Updated May 31, 2017. Accessed September 7, 2017. 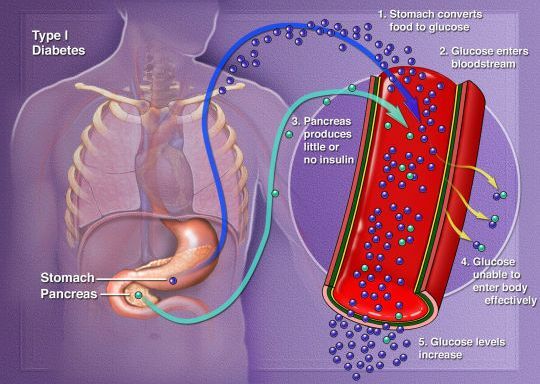 Symptoms and causes of diabetes. National Institute of Diabetes and Digestive and Kidney Diseases website. Available at: http://www.niddk.nih.gov/health-information/health-topics/Diabetes/causes-diabetes/Pages/index.aspx. Updated November 2016. Accessed September 7, 2017. Type 1 diabetes. American Diabetes Association website. Available at: http://www.diabetes.org/diabetes-basics/type-1/?loc=DropDownDB-type1. Accessed September 7, 2017.